Driving Motor Composite with Lavatory No. 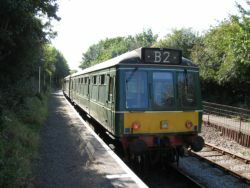 52025 was purchased in 2000 from the Swindon and Cricklade Railway, together with 52005. They saw use as Sandite vehicles in the twilight of their operational career. Some restoration work had already been undertaken since their preservation. 52005 moved to Bolton Abbey in 2001, where extensive work has been carried out. 52025 was first moved to the Bridgend Valley Railway in early 2002. From here it then moved to the Cardiff Cathays works of Pullman Design and Fabrication for a body lift and brakegear repairs. With this work completed, the vehicle moved to the Wensleydale Railway, where it was joined by 52006. It then returned to Bolton Abbey in 2005 before moving to its current home on the Avon Valley Railway.